Edited by Kathleen M. Woods Ignatoski, Ph.D. 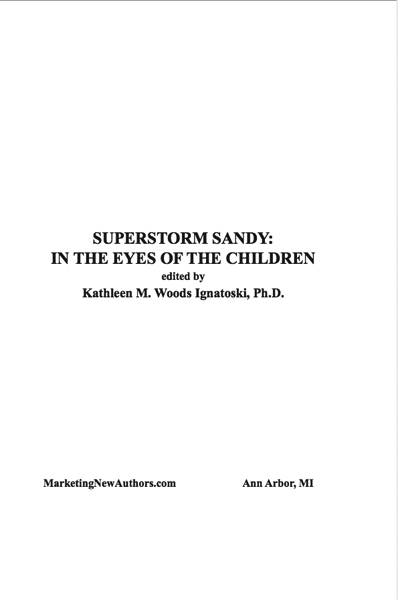 Author: Kathleen M Woods Ignatoski, Ph.D.
Superstorm Sandy affected so many people. The media have reported the reactions by politically powerful individuals as well as those by men and women who have lost their homes. However, there has been a major segment of the population who has not had an opportunity to share how this powerful storm has affected the children. 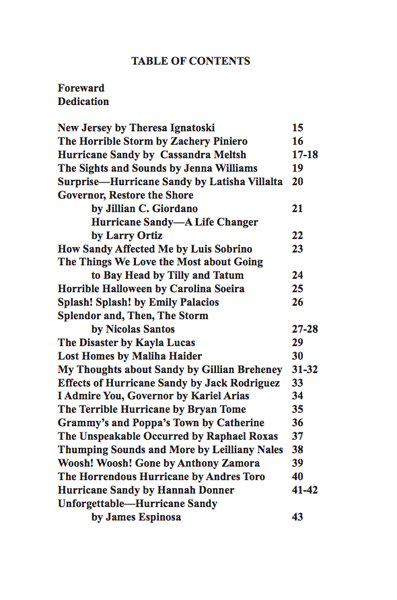 This work is a collection of essays written by youngsters affected by Superstorm Sandy. 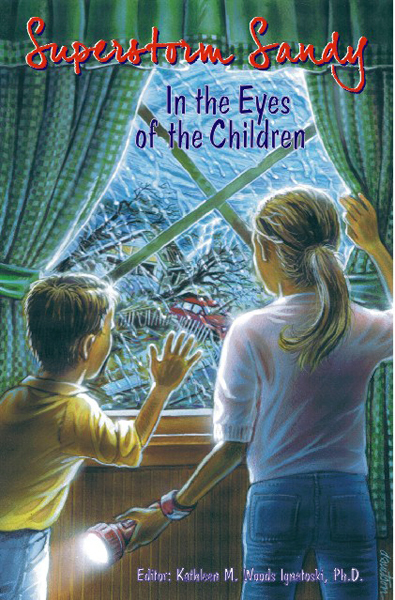 Thus, there is the title; they will tell us about this storm and its effects on their lives through their eyes. Still, this book has another purpose. It serves as a fundraiser. People are still in need of basic items, towels, sheets, toiletries, clothes, kids’ toys, and small appliances. Profit from the sales of this book will go to St. Theresa’s Catholic Church in Tuckerton, NJ. Yes, the media may have left. However, the need is still severe. And this publication is an effort to fulfill that need. Dr. Ignatoski is the daughter of a father who has lost everything in this storm. Of course, she recognized how much this loss has affected her father. 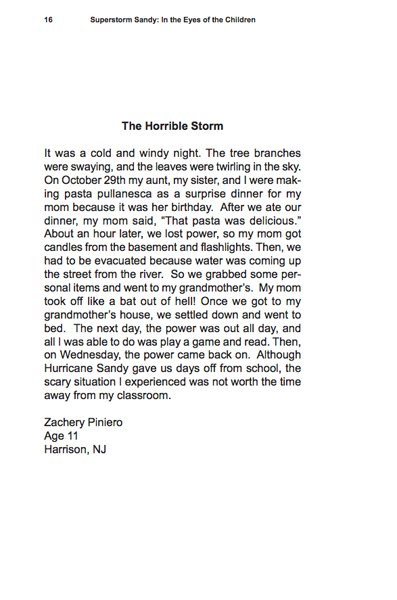 What she did not realize was the effect Superstorm Sandy has had on her daughter, Theresa. 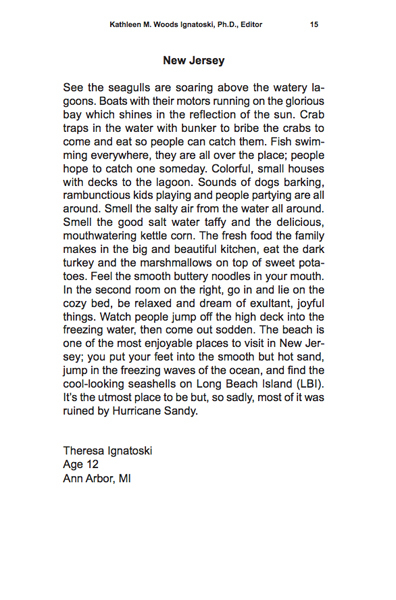 Theresa’s 7th grade teacher suggested that Theresa write a descriptive essay. Then, Dr. Ignatoski realized just how much this storm affected her feelings about the loss of her grandfather’s home. Ah! Dr. Ignatoski decided that there had to be more children also affected. What better way to help heal the children and be a positive agent than to let them write their feelings and have their essays published? 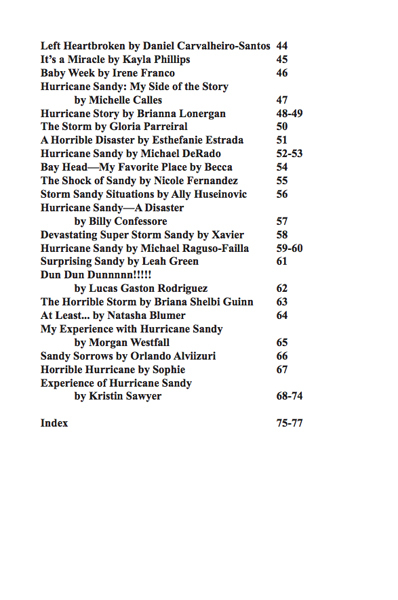 After contacting MarketingNewAuthors.com (MANA) to inquire about the fundraising possibilities, this work is the result of her daughter’s idea and Dr. Ignatoski’s efforts to garner essays and coordinate this project. 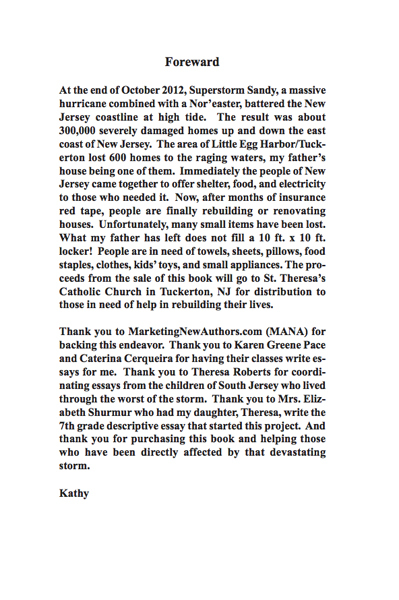 When Superstorm Sandy ravaged the East Coast, MANA answered the call to help. It donated a percentage of its sales and donated money for the number of posts by writers on MANA’s Continuous Blog Short Story to the American Red Cross. So, when Dr. Ignatoski contacted MANA and wondered if she could develop a fundraiser to continue to help those severely affected in 2013, MANA was eager to apply its fundraising services. And so, it is an honor to be a part of this very important fundraising project. MANA truly hopes many respond to this worthwhile fundraiser!